Ruth Frost and Phyllis Zillhart didn't set out to be revolutionaries. But their determination to serve the church as openly gay pastors accomplished what only two decades ago many thought impossible. 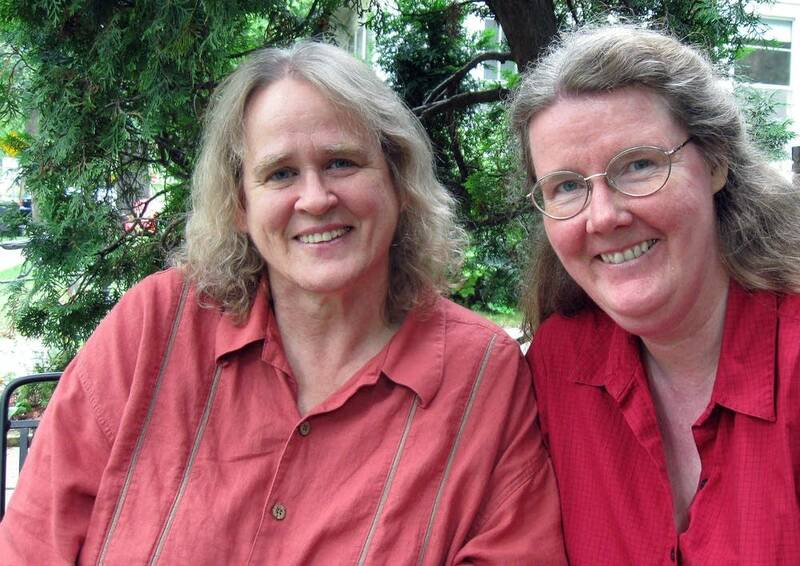 Frost and Zillhart, the first lesbian couple ordained without the blessing of the Evangelical Lutheran Church in America, once were cast out. On Saturday, for only the second time in the country, the Lutheran Church will officially welcome them to its roster of clergy. The "Rite of Reception" in St. Paul is part of a new chapter of reconciliation. The first such ceremony was held in San Francisco in July for seven pastors. Frost and Zillhart's event also will include Anita Hill, a pastor at St. Paul-Reformation Lutheran Church. The Evangelical Lutheran Church in America voted a year ago to drop the requirement that to serve as pastors, they refrain from sexual relationships. Zillhart and Frost met at Luther Seminary in St. Paul in 1984. Zillhart was 27 and fulfilling her childhood dream of becoming a Lutheran minister. She said she hadn't yet come to terms with her sexuality. Frost was 36. She was third-generation Lutheran clergy. Frost had flown to New York to meet with the bishop there about a job. Church policy prohibited non-celibate gays and lesbians from serving in the clergy. Frost went through the interview without disclosing her sexual orientation, and was welcomed into the synod. But she could feel her life pulling in two different directions. "It was an interview that went well -- with me withholding part of the truth. He welcomed me to synod and I walked out of that interview feeling absolutely crazy, and stepped onto Fifth Avenue just as the lesbian and gay freedom day parade was pouring down Fifth Avenue," Frost said. "I stood on the sidelines watching this sea of humanity waving placards that read, 'I'm gay and I'm proud.' I thought to myself, I certainly can't say 'I'm gay' to this church, and I most certainly can't say I'm proud." Frost put off her decision on taking the New York job, and returned to Luther Seminary to work on a master's degree. It was then that she and Zillhart fell in love. They decided they didn't want their relationship to be a secret. Zillhart, too, would have to turn down a job. Accompanied by Frost, she went to Bishop Lowell Erdahl, then the ELCA Bishop in St. Paul, and said she couldn't take the job. "I said, I just can't live this fractured life that's cutting me off from the source of integrity, joy, and meaningfulness in this ministry, and it's sabotaging this relationship," Zillhart recalled. "He was supportive in a private way, but said officially, he needed to remove my name from the roster of eligibility." Zillhart said she grieved the loss of her dream to be a minister, but she and Frost devoted themselves to meaningful work on AIDS prevention and chemical dependency counseling for gays, lesbians, bisexuals and transgender people. Five years passed, and their friend Anita Hill -- the other pastor who will be received with them on Saturday -- told them about a church in San Francisco that was seeking a lesbian pastor. The church hired Zillhart and Frost, and ordained them without the support of the Evangelical Lutheran Church in America. Their San Francisco congregation, St. Francis Lutheran Church, was put on ecclesiastical trial. ELCA officials suspended St. Francis for five years, and eventually expelled the congregation. But it kept operating independently. Frost and Zillhart had their hands full. The AIDS crisis was raging. Frost remembers that death was all around them. "There were gay male couples that would come and one of them would say, 'I have AIDS. I need a community in which to die, and my partner needs a community in which to grieve,'" she said. "So our congregation became known as a place of sanctuary, not only for people with AIDS, but also for their Midwestern fathers and mothers who would come out and spend their last few months with their sons before they died." Often, Frost said, parents kept their sons' sexual orientation a secret back home. But they longed to talk about their dying boys, so they would "come out" about their sons when they went home. AIDS began to change the country. Being gay couldn't remain a secret. The couple's ministry had struck something much bigger than sexual identity. Death and dying was a universal unburdening of secrets. Zillhart believes she and Frost had a special compassion because of what they had been through. "It really was sacred ground, walking the valley of the shadow, and having come from a place of my own sense of feeling previously hidden, disempowered, caught in my own shame," she said. "At that time there really still was a shame message being given, that you were sick, or evil, or wrong somehow in God's eyes." Their message to AIDS victims was simple. "We're not here to pity you. You are loved and cherished and respected." The ministry during the AIDS crisis set Zillhart and Frost on the path they are still on today. Five years ago they moved back to Minnesota. Their legal marriage in California is not valid here. Frost is now 62 and Zillhart is 53. They both work as hospice chaplains in the Twin Cities. They say they don't need to be on the Lutheran Church roster to do their work, but are tremendously happy about the Rite of Reception, and the fact that the next generation of seminarians won't have to remain in the closet. Acceptance hasn't been universal. Since last year's vote, 26 of Minnesota's 1,143 Lutheran congregations have left the ELCA. Individual congregations can still choose not to accept a gay or lesbian pastor. In 1990, Frost told a newspaper reporter she guessed it would take the church 20 years to end its discriminatory policy against gay and lesbian pastors. Her prediction was accurate. It's been 20 years and eight months since their ordination. 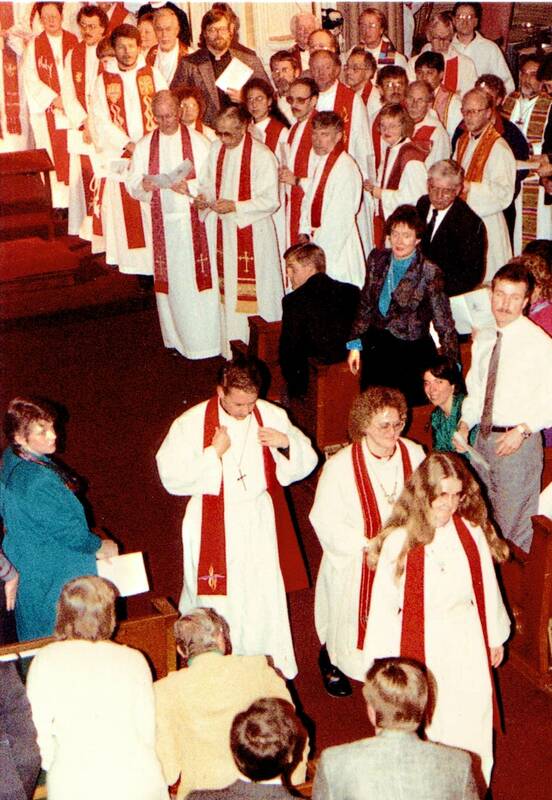 Erdahl, the bishop Zillhart said was personally supportive, but had to remove her name, told MPR News in 1990 that he didn't see change on the horizon. "I want to say I respect them as persons and believe we should listen to their witness, but that is not the present policy of the church," Erdahl said then. "I'll be very surprised if that policy is changed for the foreseeable future, and I don't know how long that will be, and if it will ever be changed." Reached this week, Ehrdahl, now 79, was surprised at his thoughts of two decades ago. Now retired, Erdahl said he'll be at Lutheran Church of the Redeemer in St. Paul on Saturday to celebrate Zillhart and Frost's Rite of Reception, with pastor Anita Hill.